Nemesia are good flowers for rock gardens, containers or for use as a bedding and front of border plants. Surprisingly they also make a nice and useful cut flower. Nemesias grow from 1 to 2 feet tall, with sparsely branched plants. They grow erect, with the flowers carried in large clusters at the top. 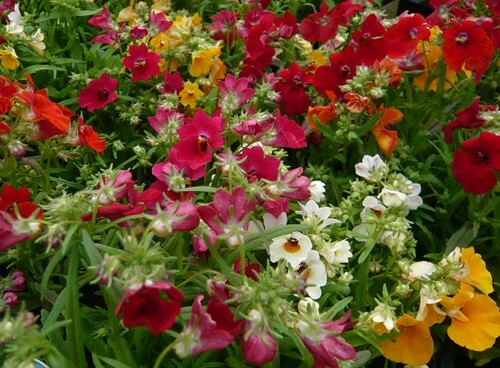 Nemesia are available in a wide color range, including yellow, orange, brown, pink, red, and lavender-blue. Nemesia are half hard annuals you can sow now or buy as mini-plugs in May. Sow seeds indoors 4 to 6 weeks before the last frost date. Seeds germinate in 7 to 14 days at 55 to 70 º.
Nemesias like fertile, well-drained soil and prefer full sun for flowering but cool evenings. Nemesia will tolerate partial shade. Transplant seedlings 6 inches apart after the last frost date. Pinching the tips of seedlings increases branching. 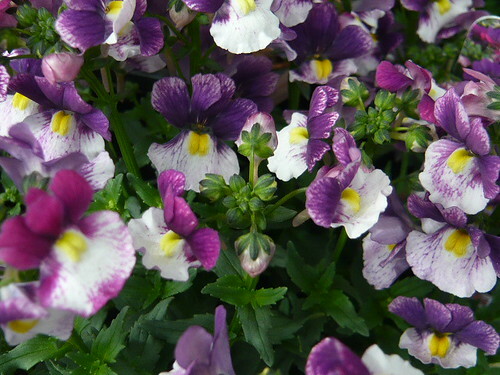 Nemesia are useful for edgings, in rock gardens, walls, and for borders. They are splendid container plants and make good cut flowers. Nemesia Masquerade are extraordinary with coconut-scented blooms! An unusual variety with exotic-looking yellow-and-white blooms. Plants are easy to grow, ideal for beds or containers and will bloom 12″ tall right up to first frosts. Nemesia denticula Confetti or Celebration are popular tender perennials distinct from their half-hardy annual relatives producing lots of attractive flowers throughout the summer. The plants prefer moist but loose sandy soil. Extra watering may be needed in a dry season. They look equally good planted in the border where they are good for planting at the front. Fire King is a scarlet-flowered variety. St. George is white and deep red bicolor. Nemesia versicolor is a similar, more compact species. It has a variety of colors including truer blues. Blue Gem is a very compact variety growing to 10 inches high with blue flowers. Nemesia caerulea (below) is available in true blue, lavender, and white. Nemesia Blue Button is one of the many series of low growing plants you can buy as plug plants right now. A delicately scented species of Nemesia caerulea with vivid bluey-mauve flowers standing out against its dark green foliage. 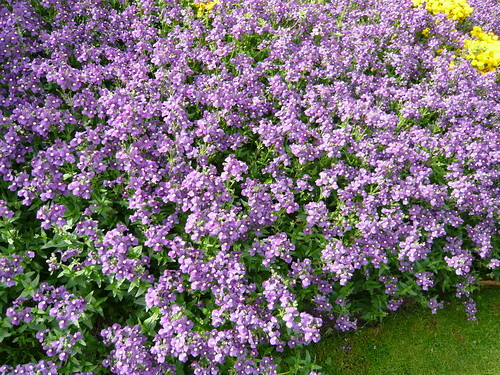 A compact but spreading habit makes it ideal for bedding, rockeries and containers. Frothy coloured annual Nemesia is available as plug plants now or seeds for winter sowing. The range of vibrant colours is increasing all the time as a result of selection and breeding. Nemesia can be used in beds, borders or to brighten up the garden in tubs, planters, on the patio or even as a windowsill pot plant. The flowers start blooming in June and last through August. Try the self colour varieties. Sow seeds late winter to mid spring at 55-60F in a good seed compost on the surface of compost and gently firm down. Germination usually takes 7-21 days. Transplant seedlings in to 3″ pots as soon as they are large enough to handle. Nemesia strumosa ‘Carnival’ offers a wide range of colours whilst Mello is a red and white variety. Nemesia strumosa KLM is a blue and white flower shown below. Nemesia cheiranthus Shooting Stars has a bright yellow and white flower with a branching habit and coconut fragrance. In Alpine conditions plants can shelter behind rocks that give them protection from wind and rain and help with drainage. Try to give your plants similar conditions to there original habitat and they will repay you for your attention to detail. There should be a slope either natural or built up. This allows plants on the North facing slope to receive 25% of the sun (and heat) of those on the South slope so those delicate plants don’t fry. Study the prevailing wind so you know where most rain will fall and plant the rain shadow area with plants that need to stay dry. If in doubt about drainage improve it by adding grit. If the soil is clay, a pile of brick rubble 15 inches below the surface will aid drainage no-end. The soil can be average soil but will not need extra nutrients or fertilizer except for special situations. Pack all crevices tightly with soil to prevent unwanted pests like mice. Plan your rock positions and lay the grain or style of rock all in the same direction. Do not mix rock types or the harmonious effect can be lost. Do not plant higgledy piggeldy but select plants that fit into a simple plan. Keep slow growing plants needing similar conditions together. 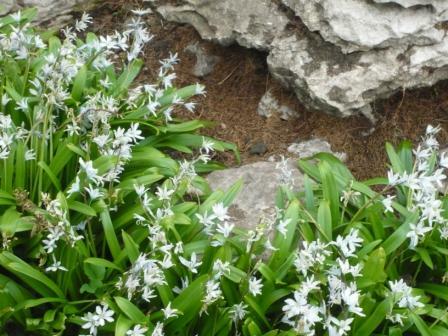 Consider haveing zones in the rockery for different plant requirements. I discovered a 6 inch pot in my greenhouse with a label saying Habranthus but I don’t know where I got the contents from. There were a couple of short, green, narrow leaves and little else until this week when flowers erupted from the soil on 4 inch stems with petals nearly as long. I water my greenhouse with a hosepipe spray except when I am adding fertilizer and recently I have been misting over all the pots and plants. You can see how the spray has stuck to the Habranthus flower. 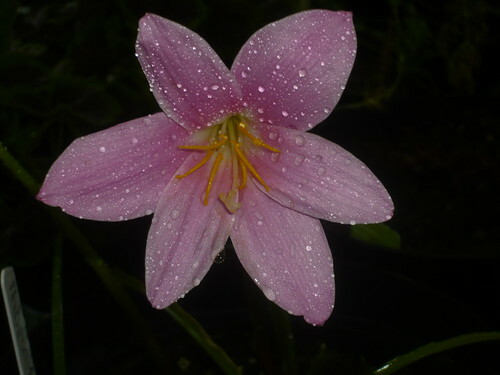 Habranthus is a genus in the Amaryllidaceae family with species from Central and South America extending into southern North America. They have narrow, linear or strap-shaped leaves. 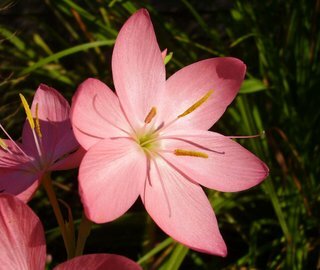 Their flowers are very similar to Zephyranthes and both are called rain lilies. This variety of Habranthus is flowering in late Summer (Sept) and offers a delicate touch to colour with minimum fuss. Habranthus bulbs should be quite hardy in the UK. 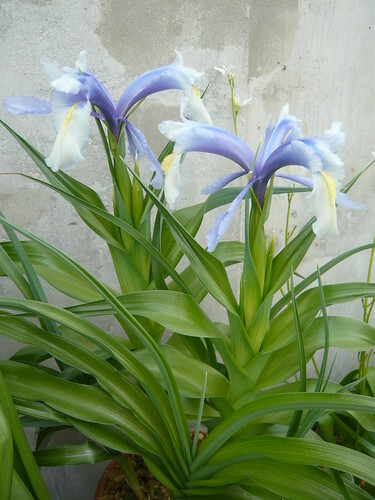 Iris aucheri is almost icy blue in its typical form, but can be white to blue with a yellow ridge on the falls. There is a deep indigo form as well. The flowers have a violet-like scent. This plant is growing in an Alpine house but it is easy, hardy, and vigorous, preferring sun and well drained soil. Water may collect in the leaves causing rot. It is one of the ‘Junos’ which make up the largest group of bulbous irises with something around 60 species. The overall form of most Junos is very distinct with fleshy corn like stems. These varieties are dormant in summer. ‘Long tom pots’ are best to accommodate the deep fleshy roots. All Juno Iris are best grown from seed.